After a while of looking for different arcade cabinet designs and mocking them up in autocad, I finally decided on a design that I liked and thought I better making it a physical thing. So, first of all, I was looking at arcade cabinets that were the traditional stand up ones. I designed the following first of all in autocad. As you can see, it’s a bit of strange, plain design. 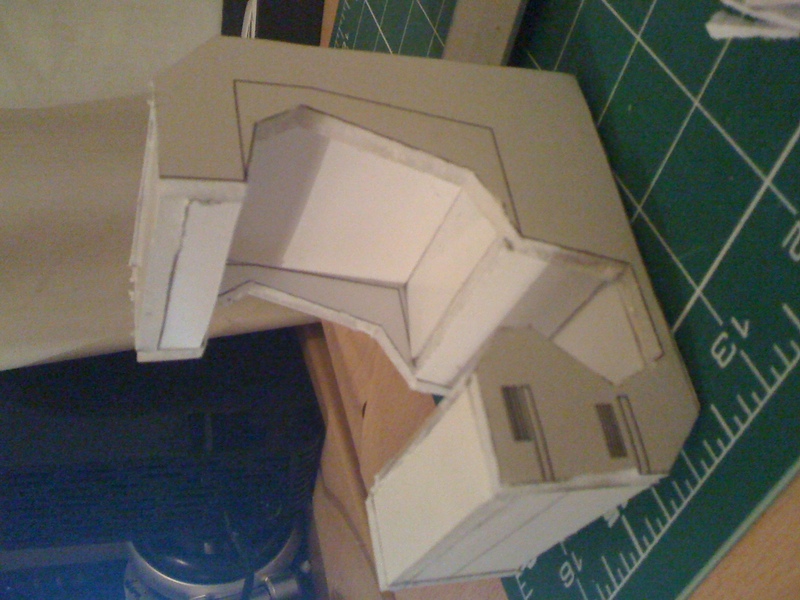 It’s taking the traditional cabinet design and adding a seat inside instead of the screen. When I tried to explain this design to people, they got confused about which way they would face as with these cabinets you face in rather than out. I also felt like it wasn’t great looking so I thought about this some more. 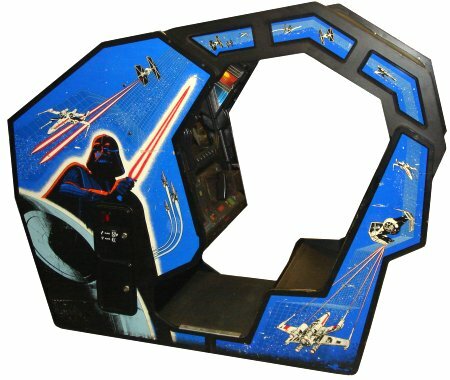 I had a look around sit in arcade cabinets and one that inspired me the most was the star wars cabinet. What I really liked about this design was that the seat was so prominent in its design. It made it super obvious that you had to sit down to play this game. The fact it’s a full enclosure as well was nice. 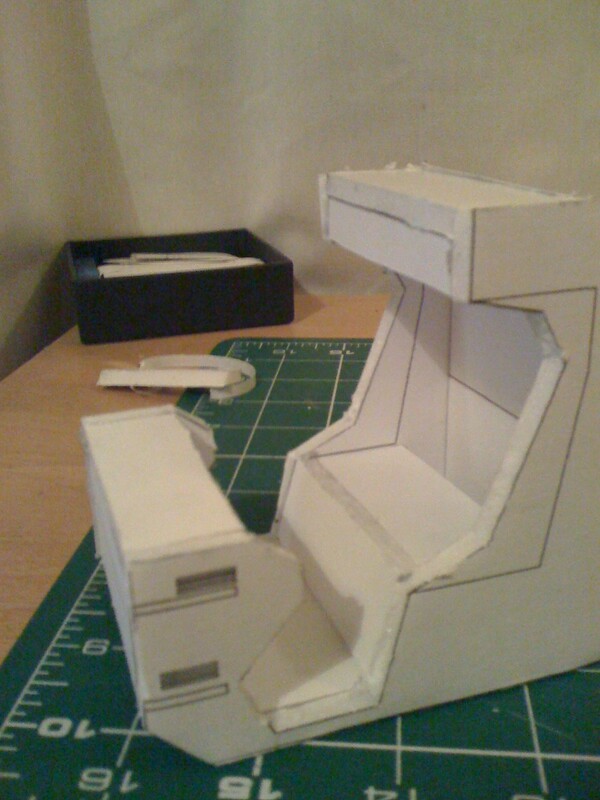 But yet, with the inclusion of the seat, it still retained the classic arcade style that I wanted. So, from this, I went away and made a new design. 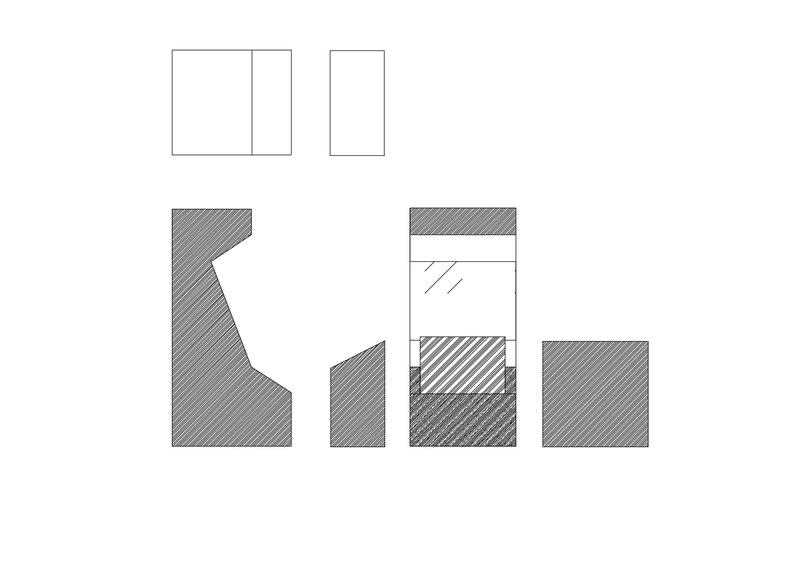 With this design, the seating area becomes more prominent in the design, the podium in front where the controls are become integrated with the cabinet and the person sitting in the cabinet is on display. This is something that was lacking from the previous design, the user was hidden away. I didn’t like this as you couldn’t see the hat and how people were playing the game. Seeing people control this game using just their heads, I think, is a big part of this game, so having the user on display is a must. After I created this design, I thought that I should make a physical object out of it to see how it would look. 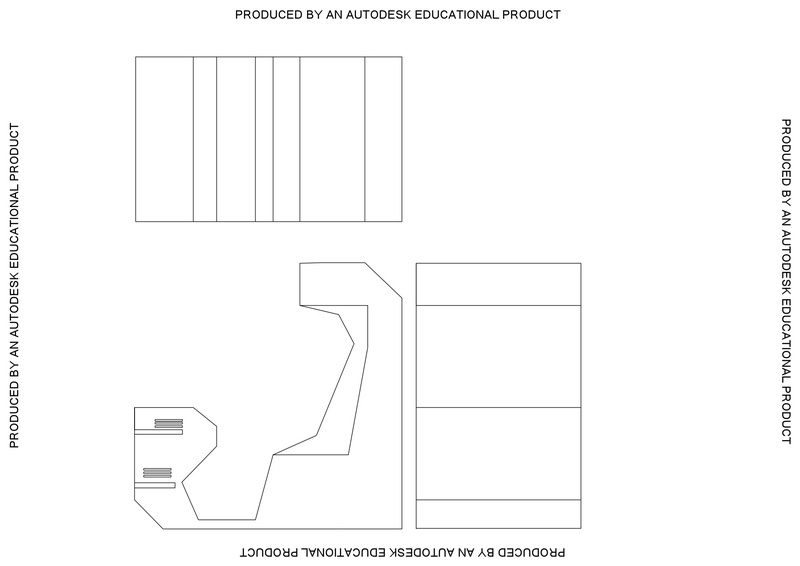 The design is made to scale (I think, I’m not great at autocad), so that it can be scaled up later on. 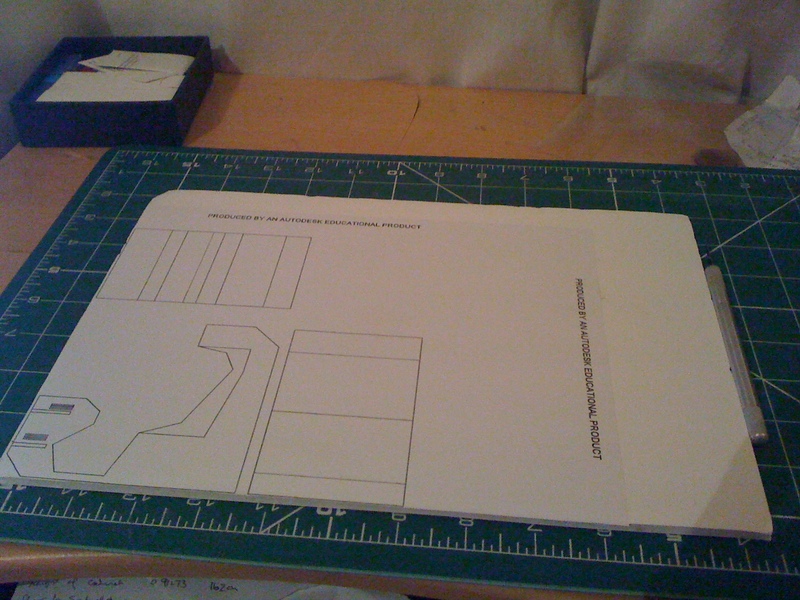 I printed out the designs, glued them to some foam board, cut them out and stuck them together. 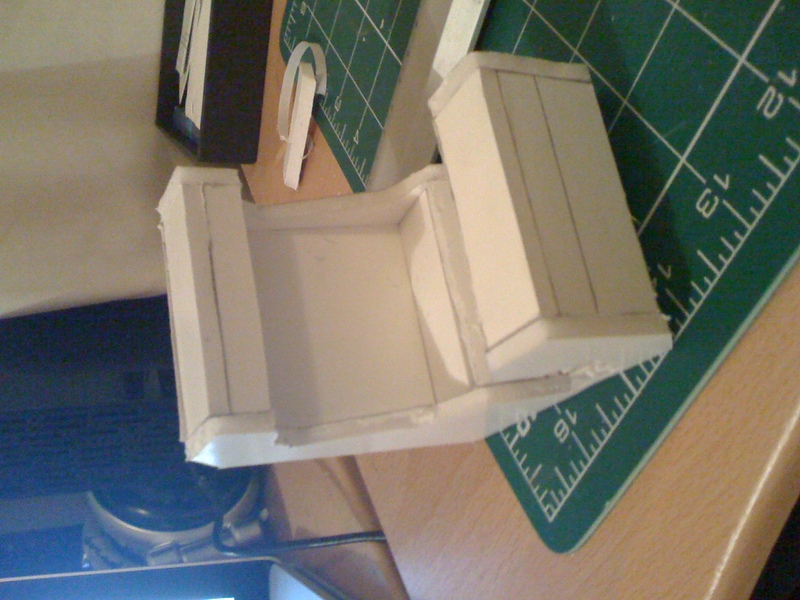 It’s pretty rapid prototyping, if very rough. 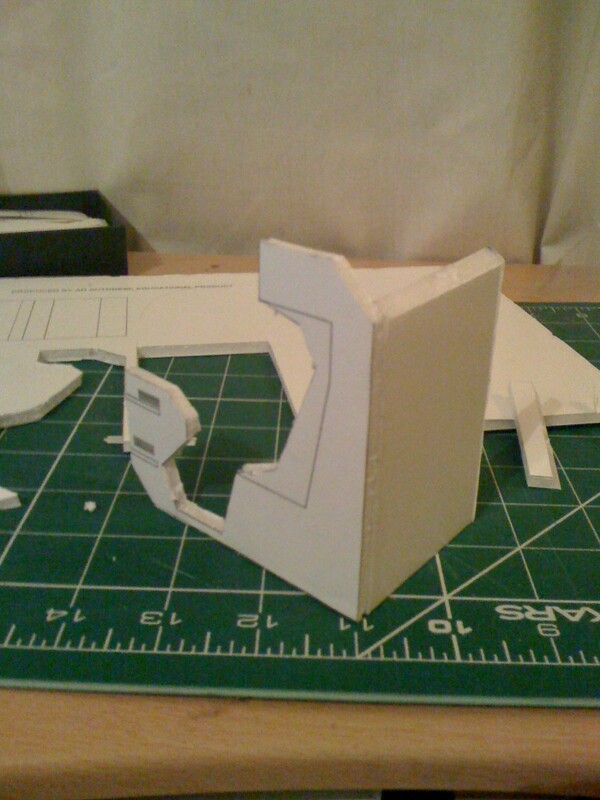 I started off with just a piece of foam board and a knife. I cut out the shapes and stuck them together with double sided taped. On the technical drawings, I have left in the area where the seat should be and some extra features for inside the front plinth. The front plinth will hold the projector and a mac mini. It will also hold some electronics for the start button and the headset base unit. 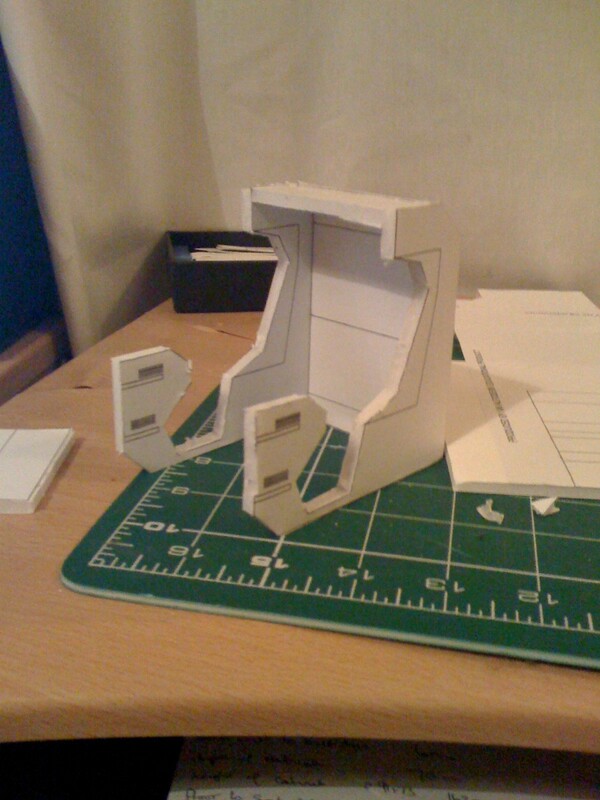 You can see on this image where I’ve placed the shelves for the projector etc and some ventilation holes. Got to remember that I cant let it over heat in there. Added and extra side and top. See, now the seat is in place. It looks a lot more like a nice booth now. Now, it’s all put together. I’m pleased with how this looks in it’s 3D form. If anything, It’s shown me that perhaps it’s too wide. You can easily sit in a position where the head tracking wouldnt work here. So that’s something I can rectify. 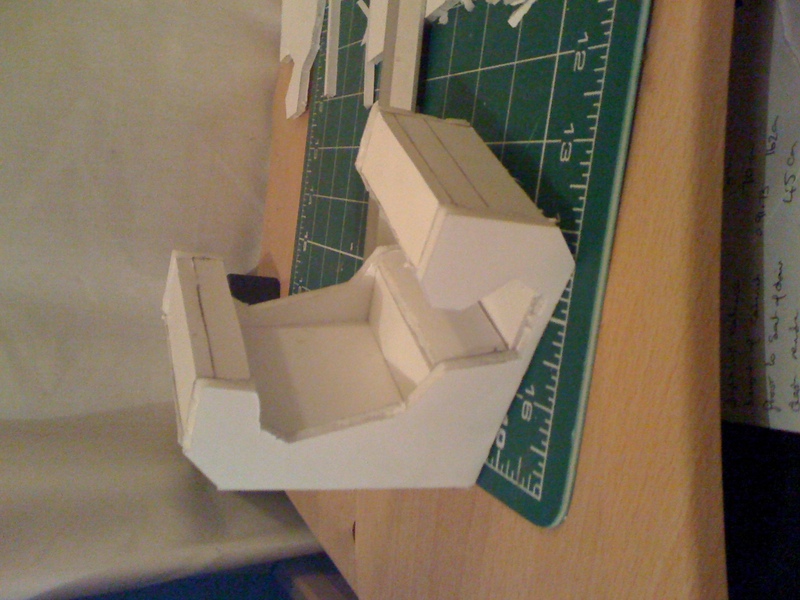 The seat looks prominent and the user will be clearly seen in this booth. I’m happy with this new design. I will have to work on it being segmented for easy moving. Hopefully that wont be too much of a problem.